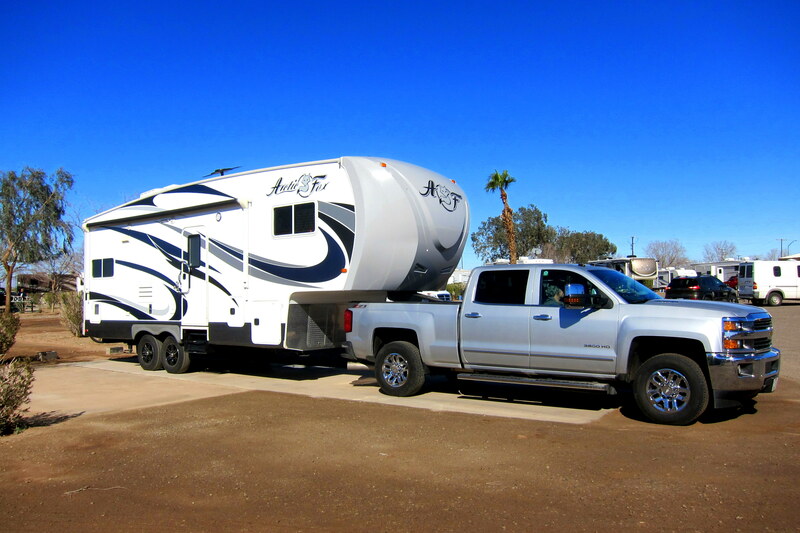 Tuesday, January 26 through Wednesday, January 27, 2016-Paradise RV, Sun City, Arizona: Kit and I are in Sun City, a retirement enclave just to the west of Phoenix, to visit with two very pleasant and very good friends. 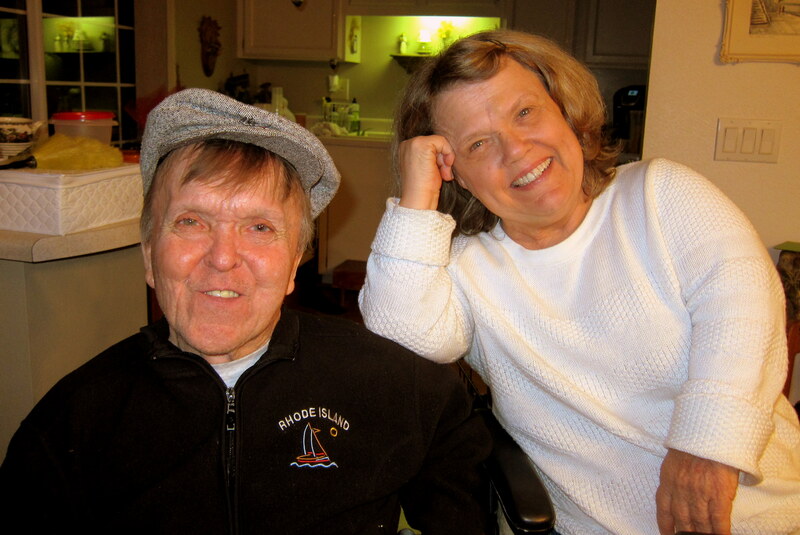 Tommy, a former actor, and Marti who is retired from medical administration and an actor in her own right, are fun to be around and possess the unique quality of perseverance and resolve in the face of health and physical limitations…..they are true inspirations! Kit and I thoroughly enjoyed dining with them, sharing fond memories of earlier years and catching up on each other’s current lives. The park where we are camped is a five star RV Resort and one of Kit’s favorite camping facilities. 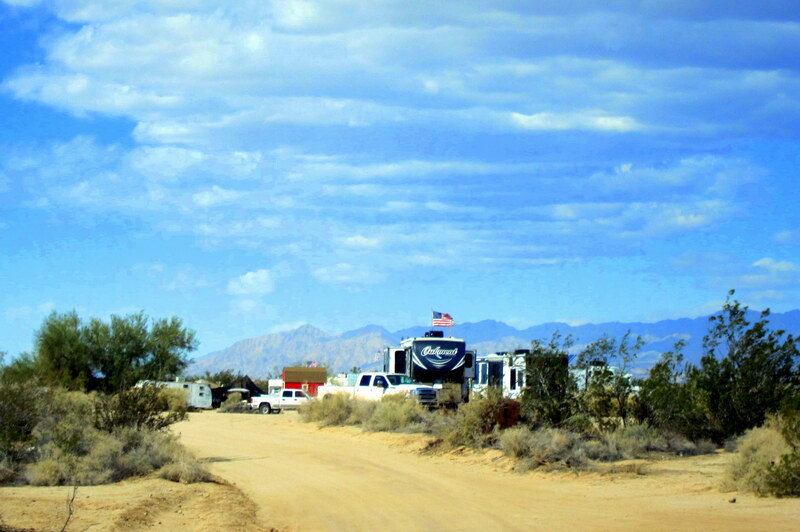 One of the benefits of staying at Paradise RV is their willingness to allow overnight campers the opportunity to wash their rigs…..a very unusual policy at any RV park and even more remarkable in the draught stricken Southwest. So during out stay, we conducted a camper cleaning blitz, inside and out…..a periodic task that is both necessary and sorely needed after our off-road excursions of recent weeks. Following our “chores”, Kit and I walked about the resort and visited with a few of the 1600 plus residents that spend the winter here. Then, upon returning to our humble RV, we enjoyed a great meal before turning in for the evening. Thursday, January 28, 2016: Up, broke camp and hit the road shortly after 1100 under mostly sunny and warm skies. 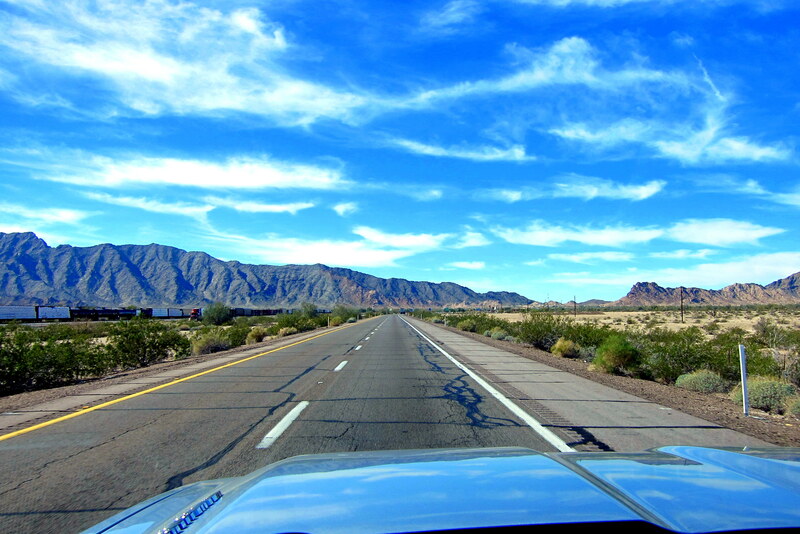 We grabbed the Aqua Fria highway south to intersect with I-10 where we headed west. 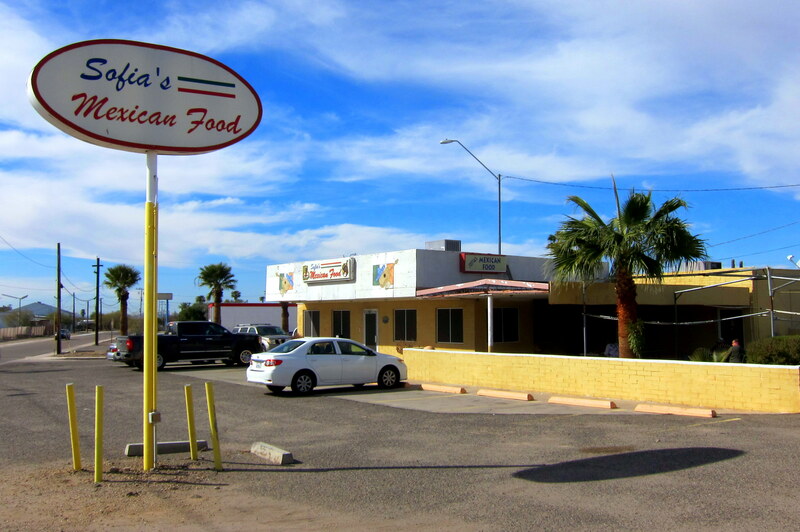 Within the hour we came to US-85 and headed south toward the small dusty town of Gila Bend, and an opportunity to sample some fine Mexican cuisine that Dewey and Bea have been raving about. The food was worthy of their praise and to lend credence to the authenticity of Sophia’s offerings we were the only gringos in the place! Thanks folks for the tip, this just became our new favorite Mexican place! Since it was getting late, Kit and I decided to stop at our go-to divert campground at Gila Bend US Air Force Auxiliary Field. 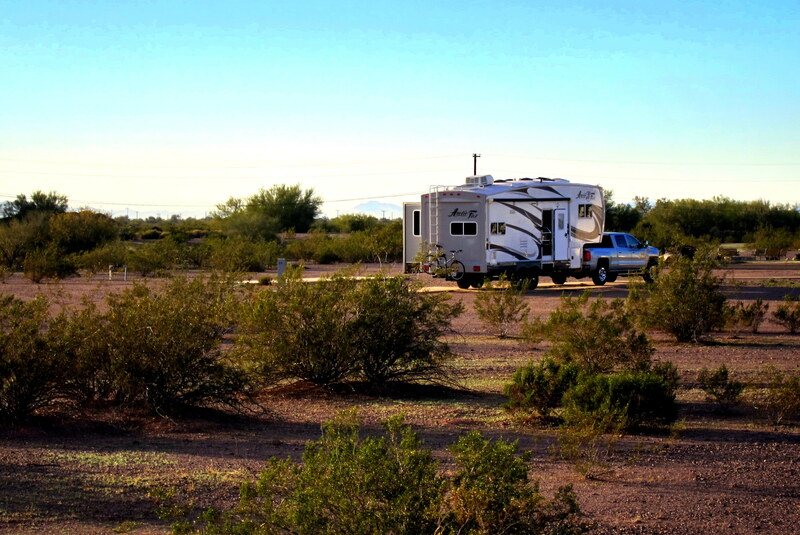 This inexpensive no-frills campground is next to the Barry Goldwater Bombing Range, so we cautiously selected a nice campsite for what hopefully will be a quiet and peaceful stay. If the location looks familiar, it may be because we stayed at this isolated and spacious desert camping facility just last month. 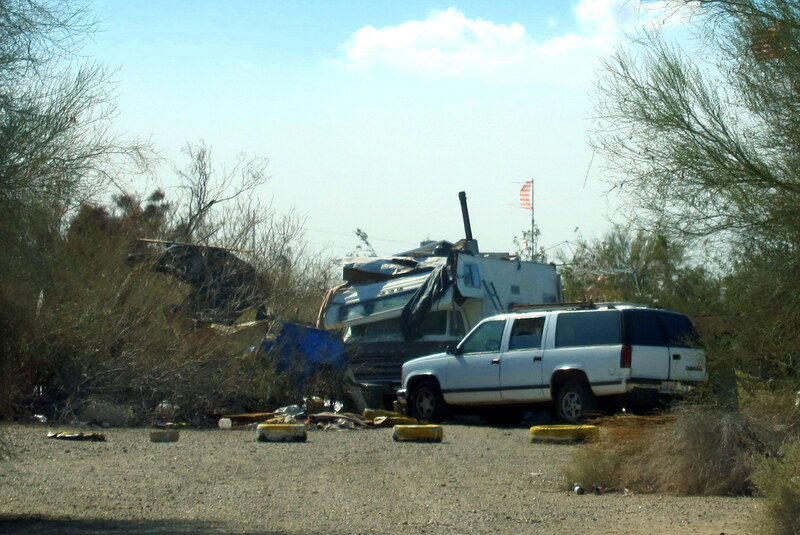 While other campgrounds seem to increase their fees annually, the Gila Bend folks keep them quite low and, as a bonus we can always find an available spot…..perhaps it’s all due to the close proximity of exploding ordinance!?!? 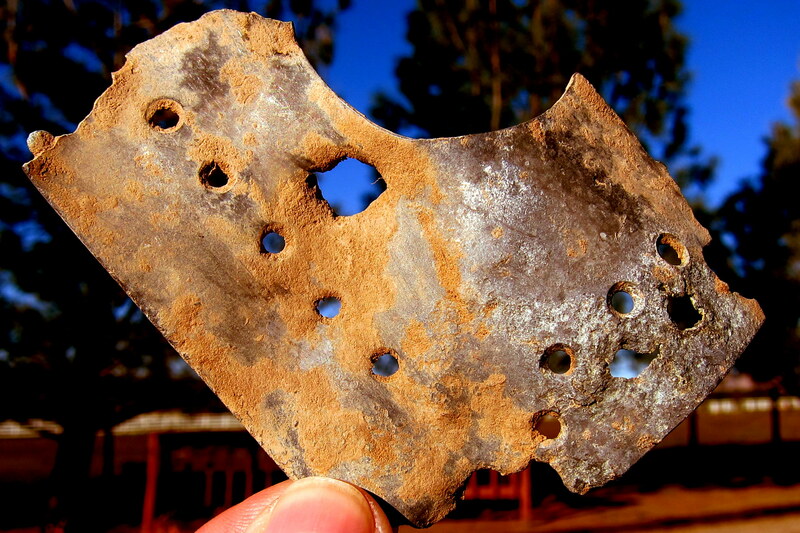 Speaking of such, as I explored the area to the east of the campground, I came upon this interesting piece of shrapnel. My imagination tells me it was from a top secret missile tested at the nearby bombing range, but in all likelihood it was probably the remnants of a snowbirds trailer that was hit by said missile. Any of my Lockheed friends want to design an RV sized CIWS for use by us retirees crazy enough to camp near an active bombing range? Following a nice meal, I took a walk into this stark terrain and photographed the lengthening shadows as dusk overcame the desert. Friday, January 29, 2016: This morning, we pulled out early and headed west on I-8…..it is a bright sunny day with temperatures hovering in the mid 70’s. Before departing, Kit and I had made arrangements to stop in Yuma and share lunch at Famous Dave’s Barbeque, with our good friends from Bend, Oregon…..John and Karen. These nice folks have the same camper we do, however John has installed 650 Watts of solar power on its roof which allows them to winter over, without utilities, on the Bureau of Land Management (BLM) Dispersed Camping Area known as Snowbird Mesa. 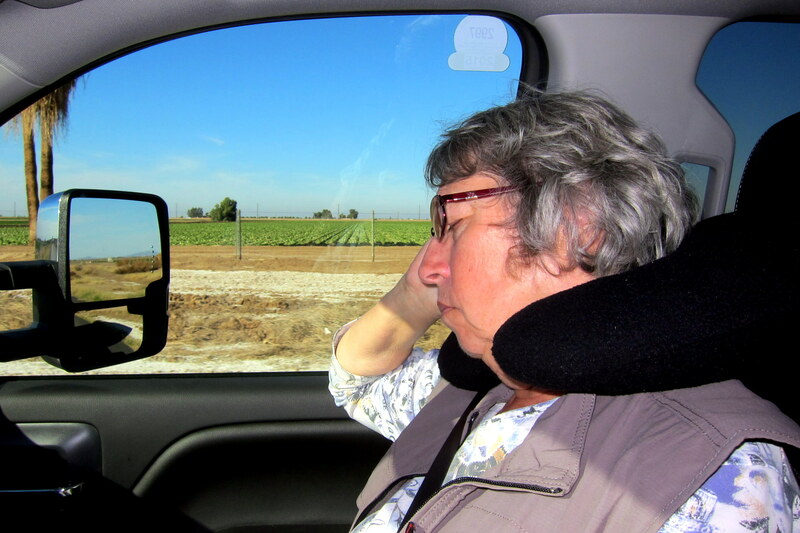 Following a great meal with great people, Kit and I continued on I-8 and by 1500 hours we were crossing into the State of California where we encountered the Pacific Time Zone. 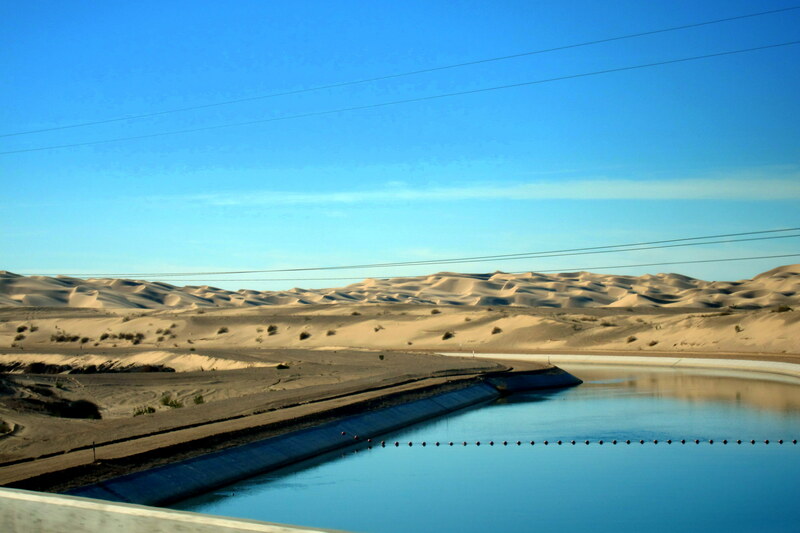 Continuing westerly soon found us passing through the Algodones Sand Dunes of Southeastern California and paralleling the All-American Irrigation Canal. This 270 square mile sandbox is managed by the BLM for off road recreational use. On any given day, there are ATV’s, Dune Buggies, and Sand Rails launching themselves off the lips of the steeply banked dunes. 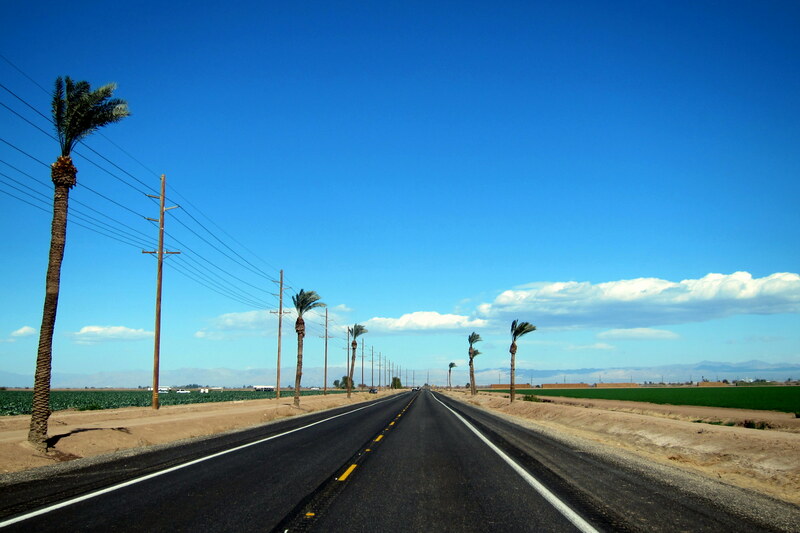 Just as the sand petered out the Imperial Valley Agricultural area came into view. Miles and miles of everything needed for a healthy vegetarian meal was growing in the fertile soil. Kit really enjoyed seeing the world’s largest salad stream by her window. 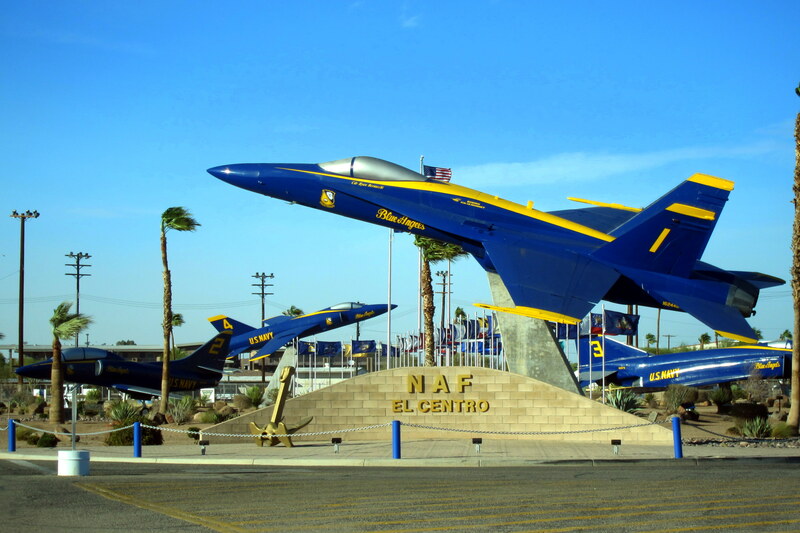 An hour later we pulled off the interstate and entered the El Centro Naval Air Facility, the winter home of the US Navy’s Blue Angels. Here, we found an available camp spot for the next few days. Usually, we just blow through El Centro on our way to the coast, or at the very least stop for a quick overnight stay at the Wal*Mart…..however this trip, it’s time to explore this desert city! Saturday, January 30 through Monday, February 1, 2016-El Centro, California: Spent the three days here poking about the area, resupplying at the base commissary, and resting up for our push to the left coast. We also took advantage of a movie that was showing at the base theater…..The Big Short. The film explained in layman’s terms how the subprime mortgage fiasco torpedoed the US economy a few years back. If you haven’t seen this excellent film, we highly recommend you do so. I have a simple and naïve concept of the world of high finance. It’s my belief that working Bill put some of his salary into a future box for retiree Bill…..kind of a currency time travel if you will. Then retired Bill would be able to live comfortably on the thoughtful contributions of young working Bill which, hopefully, would have been enlarged by Dow or Jones (the dollars, not Bill). Well the financial meltdown of the US economy and the resulting erosion of retired Bill’s portfolio hit him square in the assets (pun intended)!! You see, at the very moment the market was crashing all around us, Kit and I were traveling along in ignorant bliss enjoying our newly purchased camper pulled by our newly purchased truck which we acquired using newly retired Bill’s newly acquired cash (are you following all that?). That is until we stopped to see a friend in Eastern Ohio who happened to mention that the sky was indeed falling…..Yikes! Fortunately we didn’t panic and over the ensuing eight years our portfolio has rebounded…..it was a scary time for newly minted pensioners however! The film “The Big Short” helped explain what went wrong and who was to blame, and what happened to the bozos that caused all this to happen. Spoiler alert…..not much!?!? As mentioned earlier, “The Blues” train for their upcoming show season over the vast desert terrain surrounding the town of El Centro. The F/A-18 Hornet aircraft with their famous blue and gold paint scheme were in the air everyday but Sunday and on their return to base, the team would put on a mini air show with loops, spirals, and low passes. During these times, I’m sure all productive work pauses for miles around as folks crane their necks skyward to watch the world finest Flight Exhibition Team (yea, I’m biased) do their thing. Also mentioned earlier, was the Imperial Valleys contribution to the world’s supermarkets. 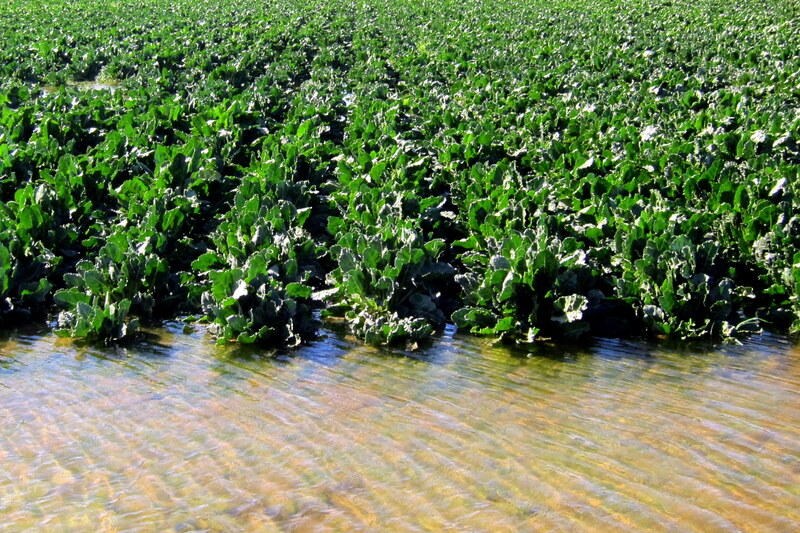 The fields for miles around were planted with lettuce, spinach, kale, soybeans and 70 other crops……all this farming requires millions of gallons of water for irrigation. Much of this water comes from the Colorado River via the All-American Canal. As the local motto goes, “Water is King, and this is its Kingdom”. The irony is that the 180,000 folks that inhabit the Imperial Valley receive 70% of Southern California’s allocation of Colorado River water and the remaining 20,000,000 people living outside the valley receive the remaining 30%. 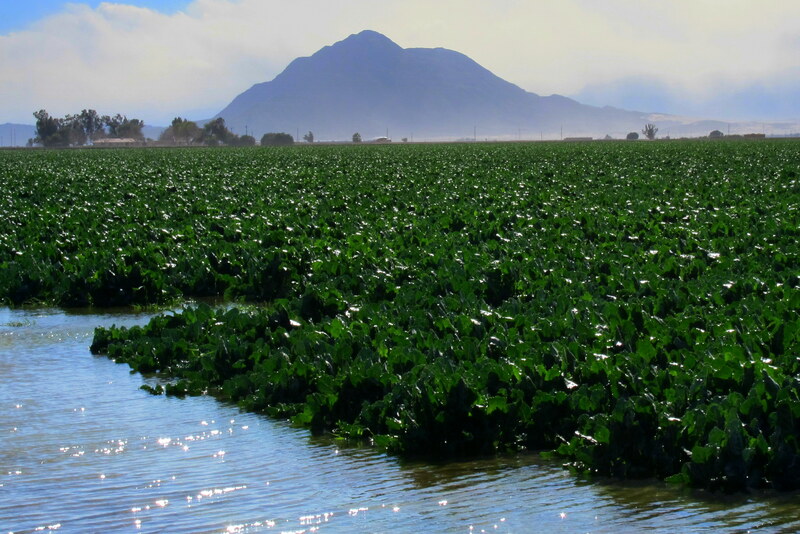 As the southwest enters its fifth straight year of drought, the Imperial Valley’s legal claim to all that water is in jeopardy…..be prepared for rising vegetable prices! One of the days during our stay, we made a road trip on CA-111 to investigate some interesting locals to the north. 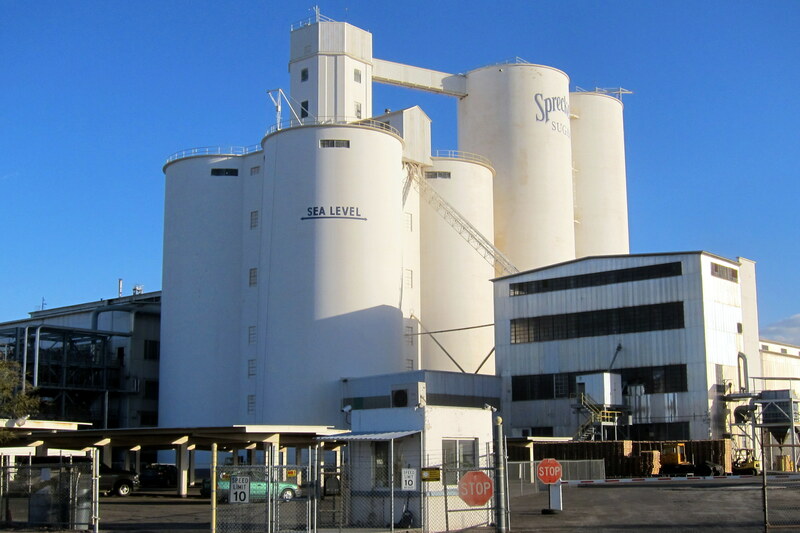 On the way, we passed through the town of Brawley which sits at 112 feet below sea level, a fact that is advertised on the storage silos of one of the town’s main employer’s, The Spreckels Sugar Company. As Kit and I neared the town of Niland, we followed a few dusty roads to the unusual enclave of Slab City. 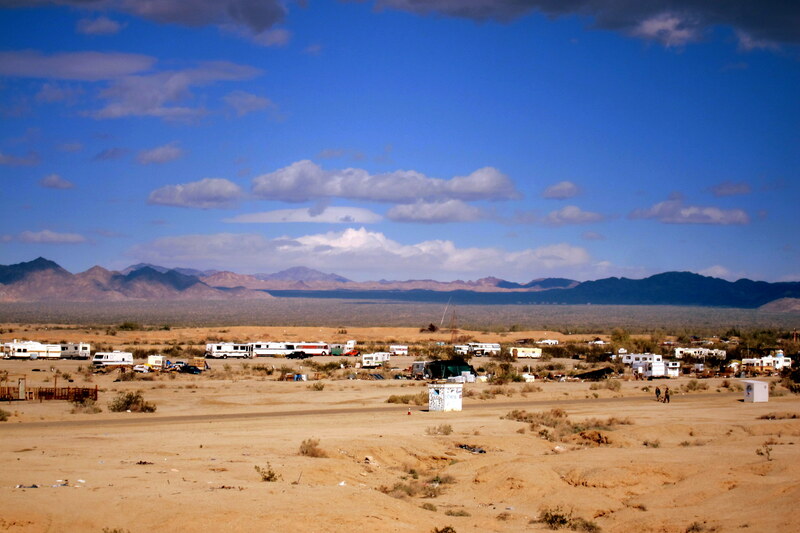 Slab City, or “The Slab’s” as it called by the inhabitants, is a squatter community of folks that have set up their winter homes on the concrete foundations (slabs) of a deactivated US Marine Corps base formally known as Camp Dunlap. 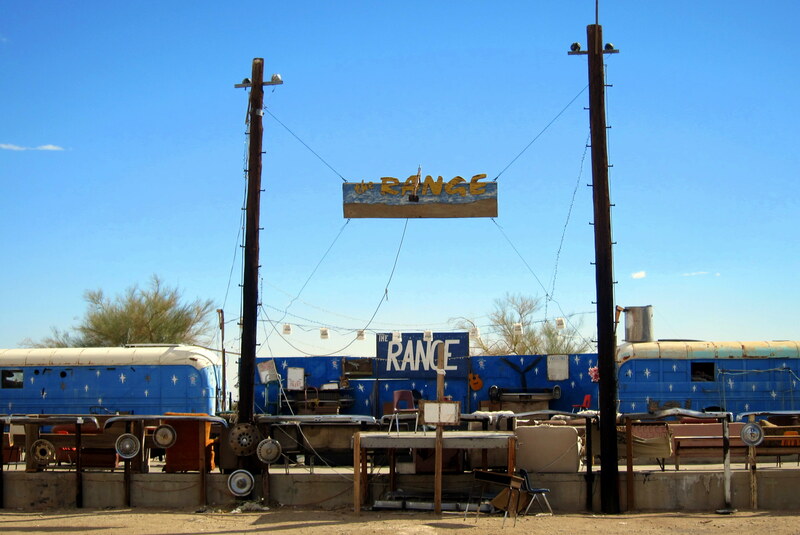 Residing at Slab City is free…..in more ways than one. There is no running water, sewer disposal, trash pick-up or electricity other than that generated by the “slabbers” using solar panels or wind turbines. This place is quite unique, relys on a barter economy, and the location places it virtually “at the end of the road”. 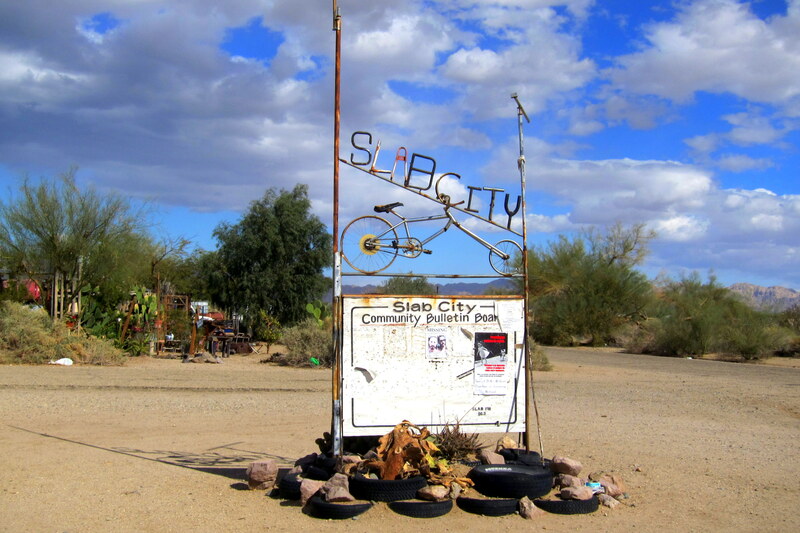 Slab City is a mecca for displaced or disenfranchised folks that live on the government dole, and a smattering of retired snowbirds. Slabbers stake out their property lines using signs, stones, tires, or other barriers, and whoa be the slabber that violates this unwritten and largely unenforceable property rights policy. In addition, there are a few well-to-do snowbirds that have discovered Slab City and have gentrified their corner of this desert commune. However, the majority of slabbers are either low income or mentally ill folks that have found acceptance and accommodations at The Slab’s. 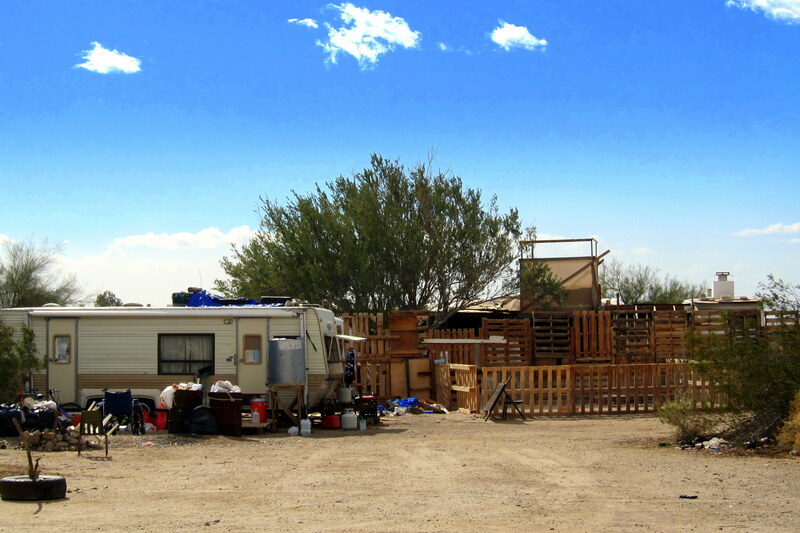 Slab City is, well….a city! Complete with its own social media apparatus in the form of a bulletin board. And a town center with a performance stage where “town meetings” are occasionally held, but more likely the musically talented play and sing on Saturday nights for the dancing pleasure of the free-spirited community. A few entrepreneurs reside at The Slabs as well, including itinerant craftsman in the creative and necessary art of roach clip manufacturing. 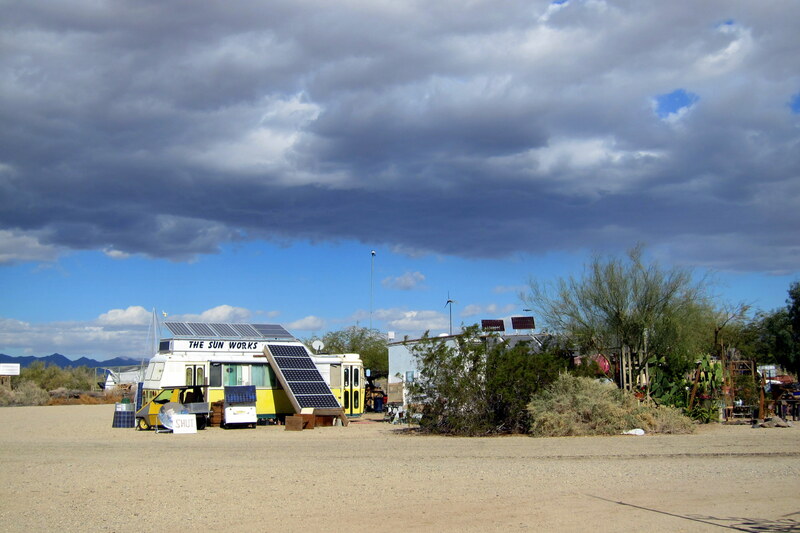 There is also a few mechanics, a barber and a purveyor of solar panels, all who work and reside in Slab City. 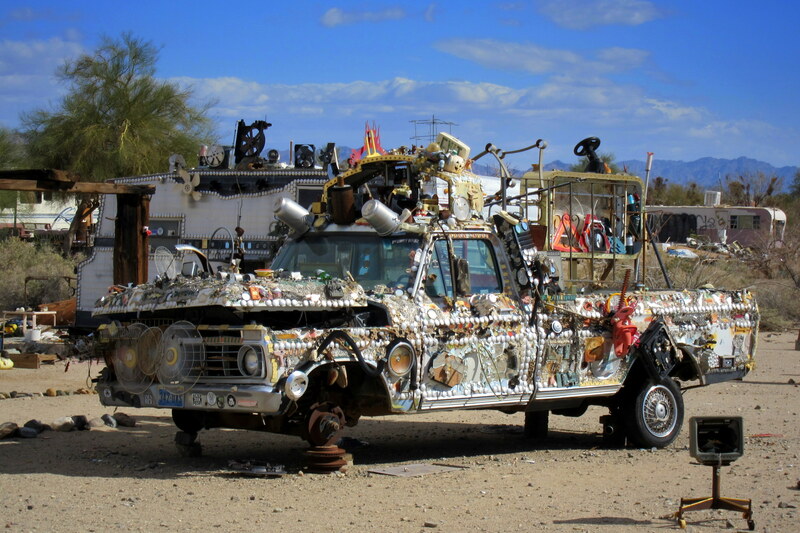 Located in front of one Slabber’s abode sits a long neglected “Art Car”, likely a refuge from a past Burning Man Festival…… http://burningman.org/. 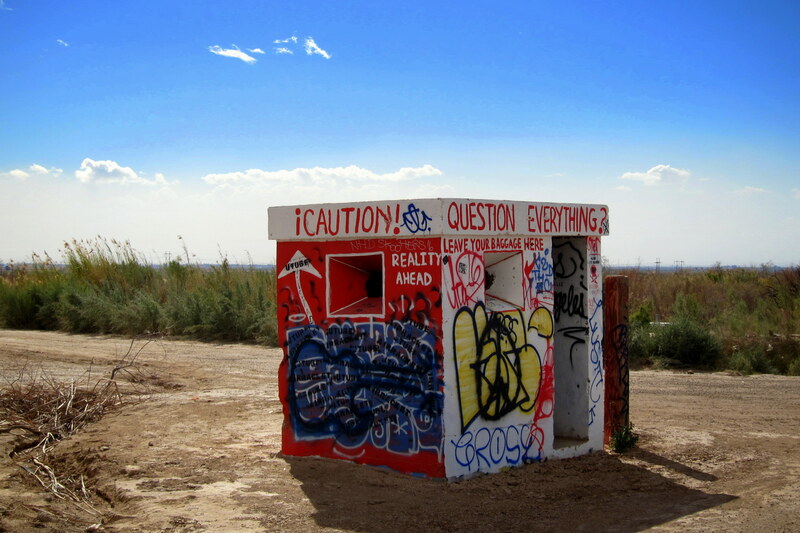 Leaving Slab City, the obverse of the sentry post has art work that speaks to the feelings of most Slabbers. 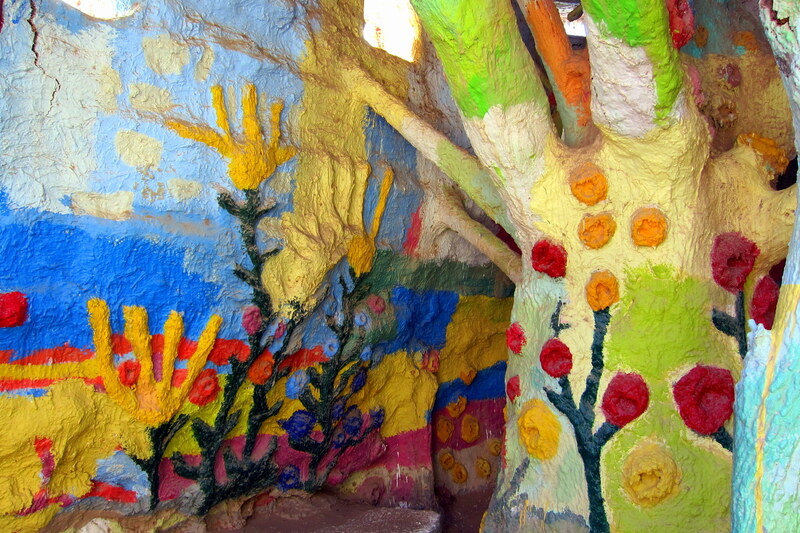 Slab City is a wild, wonderful and truly free place…..might be just the last such place on earth. Just down the road a piece stands another interesting area to explore. 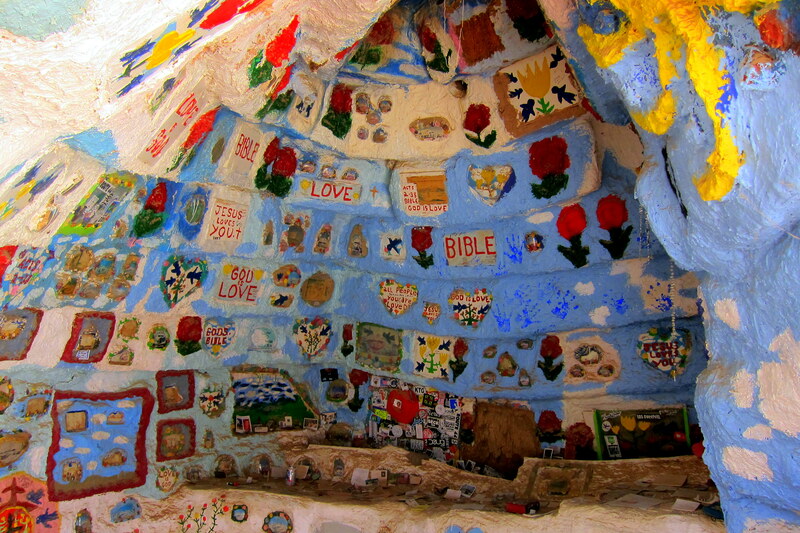 Salvation Mountain was created and decorated by local resident Leonard Knight, on a small sandstone hill a mile or so from Slab City. Leonard propped up old tree trunks along a hillside and covered them with straw and adobe mud. 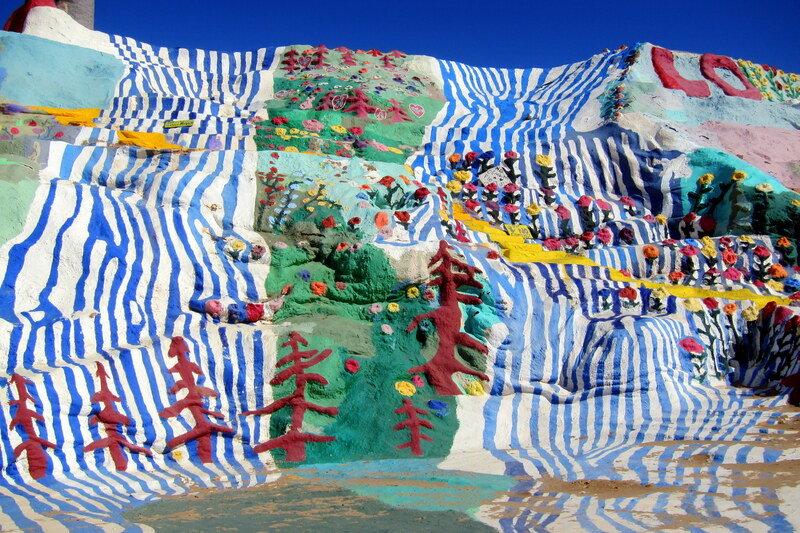 He then painted his “mountain” with bright colors using thousands of gallons of donated acrylic paint. 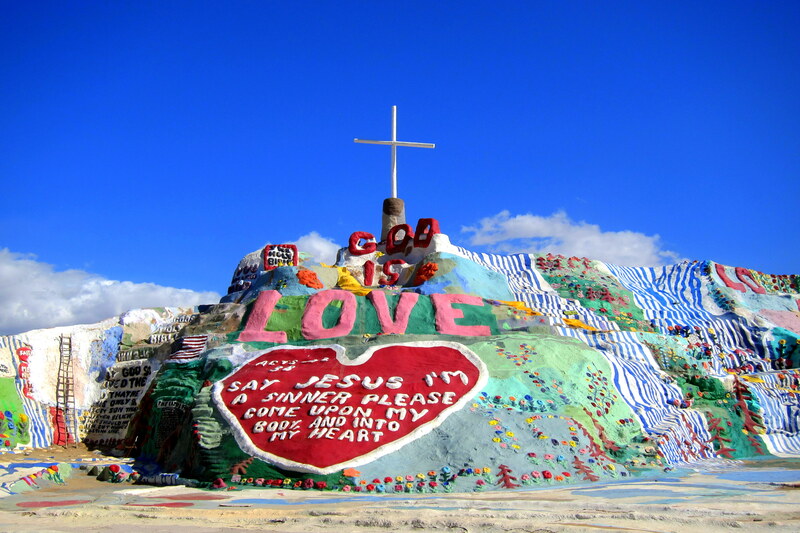 His theme was spiritual salvation which is evident by the many bible verses and inspirational messages painted on his mountain. 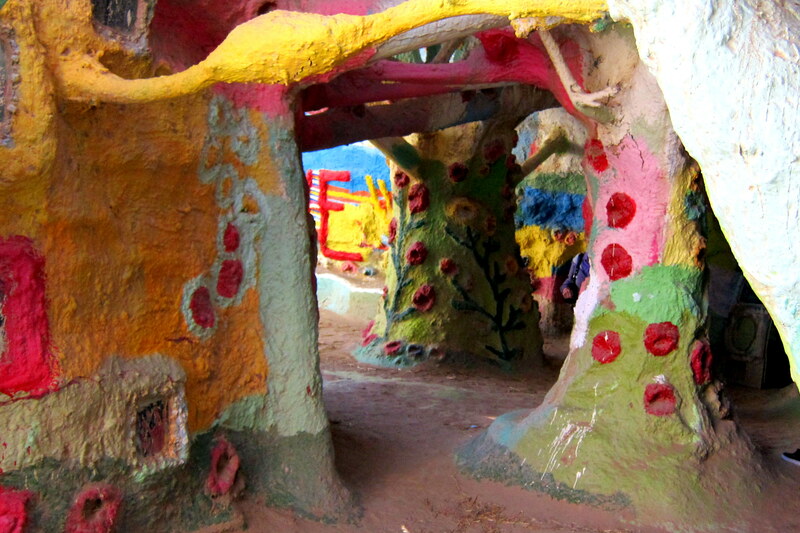 As the structure grew, Leonard carved out and created equally colorful passageways that honeycombed the mountain. Many of these pathways lead into meditation rooms adorned with messages of peace and love. Incorporating found objects into his sculpture, Leonard not only was able to recycle junk that was littering the desert floor but also help define the pure meaning of mixed-media art. 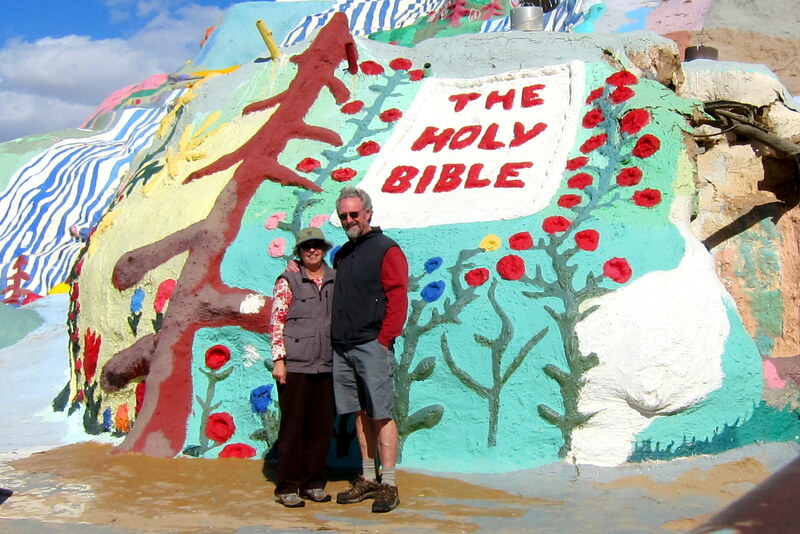 As one wanders about Salvation Mountain, it is obvious that his art improved and his writing evolved during the 28 years it took to create this folk-art masterpiece. Leonard owned a vintage Airstream travel trailer that he decorated with additional prose and was used as his primary residence. 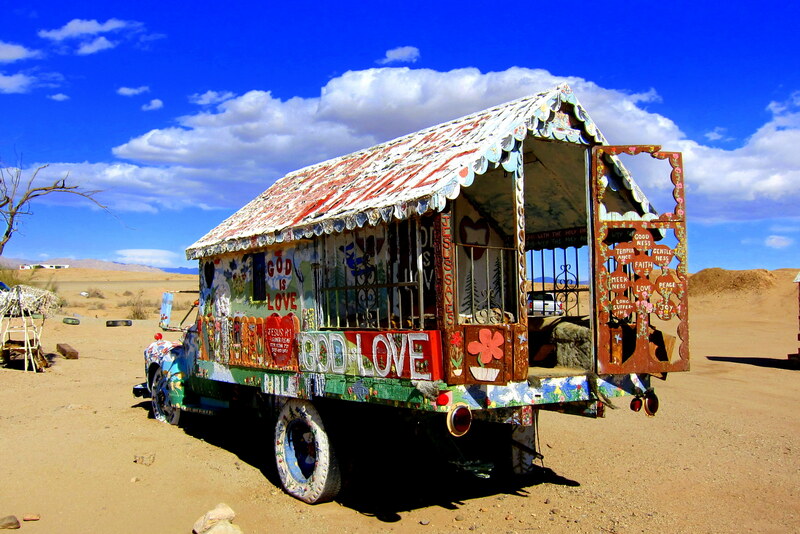 However he preferred to stay in his homemade camper truck embellished with more of his signature artwork. Leonard Knight passed into heaven two years ago at the age of 83, but his mountain continues to be cared for by a cadre of volunteers. The man may be gone but his life will live on in the inspirational structure he designed and created by hand…..RIP Leonard. 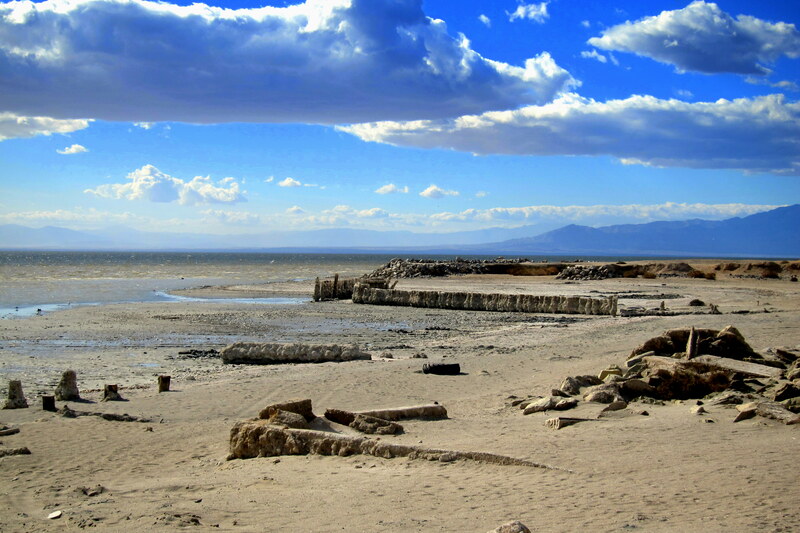 As we headed back to the campground, Kit and I decided to detour westerly and take a peak at the great Salton Sea. 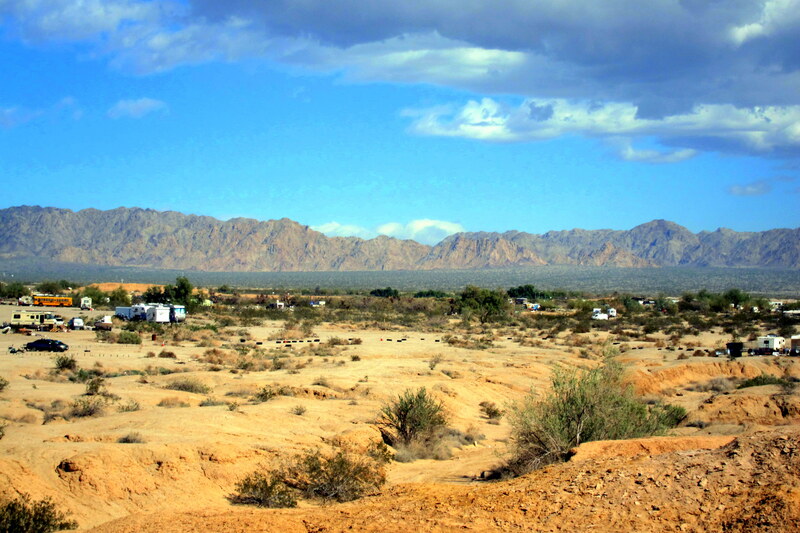 This inland ocean was created in 1905 as a result of man tampering with dug canals from the Colorado River in an effort to increase irrigation flow to the fertile Imperial Valley. 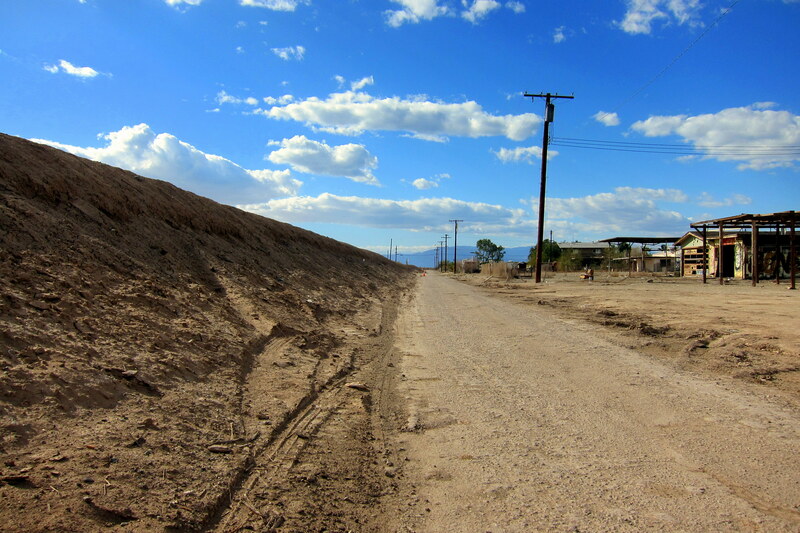 A major breech in a large canal allowed river water to flood the former dry lake bed of the Salton Sink. It took over two years for engineers to stem the flow and by then the Salton Sea, as it became known, grew to approximately 340 square miles. While poking about the area, Kit and I stumbled upon a most unique ghost town, the once thriving seaside resort community of Bombay Beach. 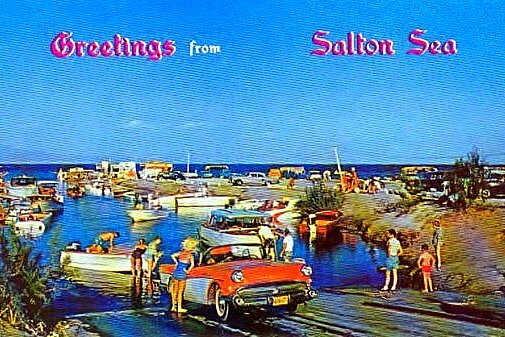 Back in the 1950’s investors seeing an economic opportunity in developing the shore of the Salton Sea started to build resort villages and promote them as a vacation and retiree destination to newly discharged veterans of World War II. 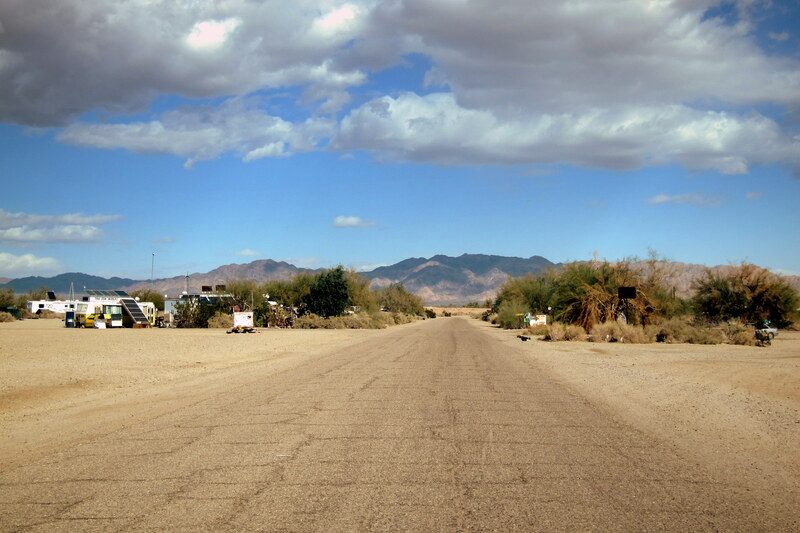 In addition to pandering to the moneyed resort crowd, Bombay Beach was also famous for being the lowest town in the United States due to its negative 225 foot elevation. Over the ensuing decades the seas rising salinity coupled with agricultural runoff, caused massive fish and bird die-off and the resultant stench at the self-proclaimed “California Riviera” caused Bombay Beach to lose a lot of its appeal. The final death knell was the result of torrential El Nino rains in the mid 1970’s that flooded the low lying beachfront area. 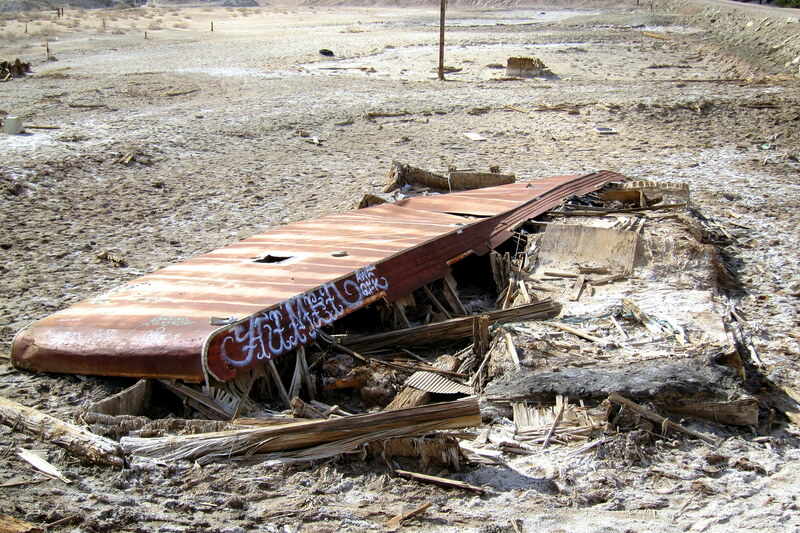 Today, all that remains of Bombay Beach are the crumbling foundations of former resort hotels. And the bones of beach homes that have succumbed to time, scavengers, and the harsh environment. In addition to the salt encrusted remnants of early “caravan trailers” owned by early RV’rs. 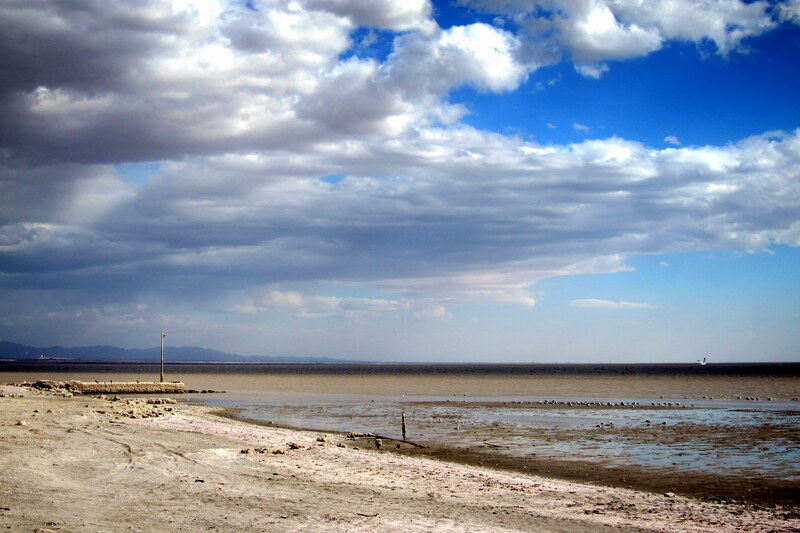 Since there isn’t any natural drainage from the Salton Sink, the state had to wait for the water to recede by evaporation before building a levy. 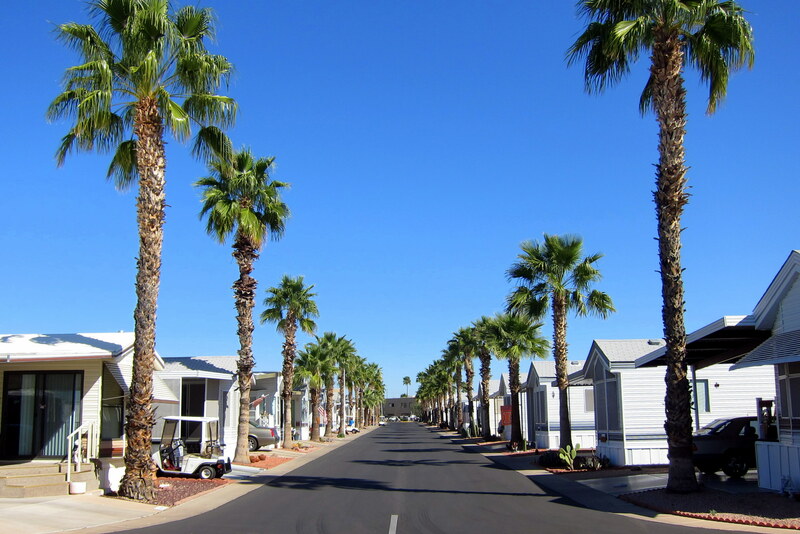 Later, the protected area of Bombay Beach was repurposed as a low income retiree community. 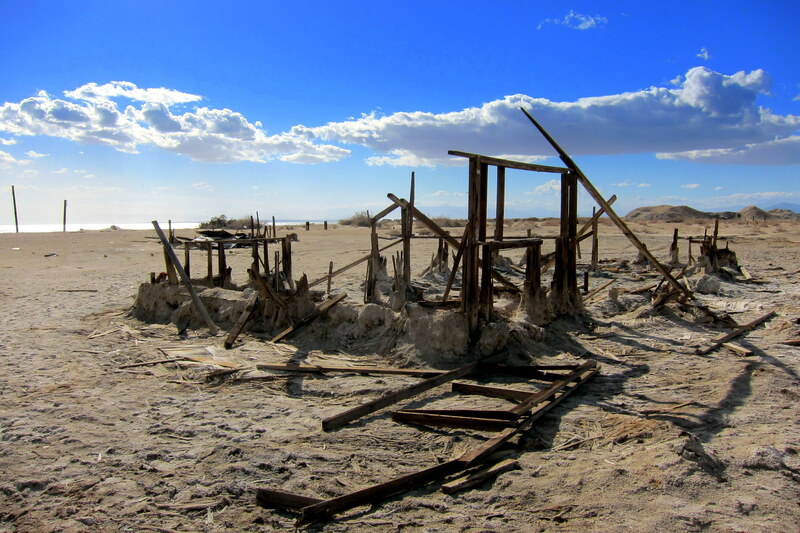 None of the current residents of the new Bombay Beach can see the water due to the levy and beyond the earthen barrier the once thriving beach community remains in its desolate state as a lasting testament to what can happen when man fiddles with Mother Nature! While returning to the camper, Kit and I were treated to a spectacular sunset that compared starkly with the mono-color tones of Bombay Beach. Well, tomorrow we head to the coast and a long term stay in our ancestral hometown…..stay tuned! 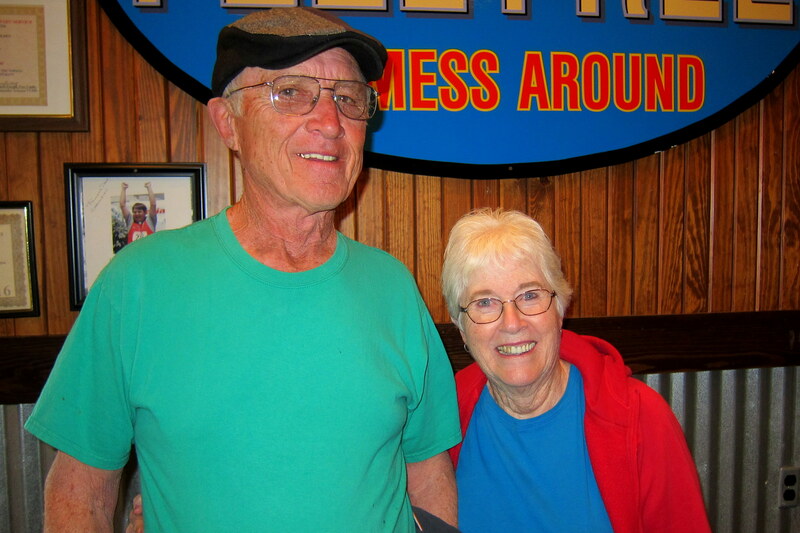 Kit’s Bit’s: We thoroughly enjoyed our visits with both Tommy & Martha and John & Karen! It’s always good to see them. Passing through El Centro, for maybe the 100th time over the years, I was glad to finally have the opportunity to explore the area. It’s quite a nice town with some beautiful parks for the community to enjoy. I was looking for a park where we took the kids many years ago for an afternoon picnic. In the park, there was a huge wooden barrel where the kids could roll around in. They had so much fun in that thing! We have pictures (somewhere) of them playing in it. Unfortunately, we couldn’t find it. I even asked a few ‘elderly’ folks we saw about it and they couldn’t remember it. So, my mission when I get home is to find the pics and figure out exactly where this barrel was. 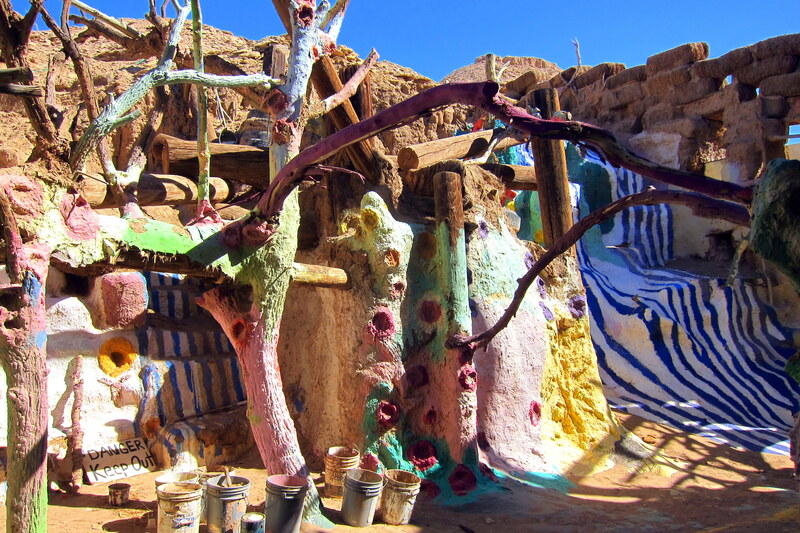 Really enjoyed reading about the three “ESSES”—–Slab City, Salvation Mountain, and the ghostly Salton Sea Resort!! WOW!! WHAT AN INTERESTING JOURNAL. 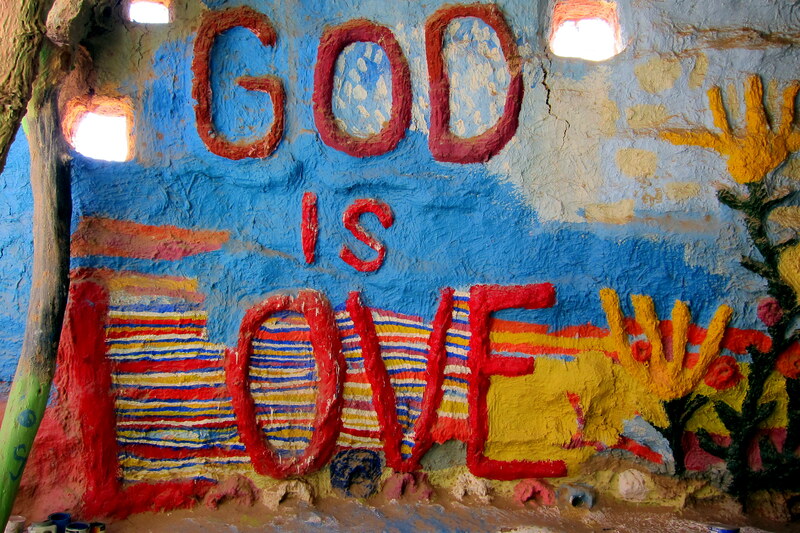 SLAB CITY, SALTON SEA AND AN AMAZING SALVATION MOUNTAIN. SURE A SHARP CONTRAST TO THE NORMAL SITES IN YOUR TRAVELS. SURE NICE TO SEE HOW THE OTHER HALF LIVES. NOW I KNOW WHEN I RUN INTO THE NEXT RECESSION JUST WHERE TO HEAD!! MERRINGMEETING BAY OPENED LAST WEEK, THE EARLIEST THAT I CAN RECALL SINCE WE BUILT HERE IN 53/54. LOTS OF WATERFOWL HERE ALREADY, BUT NO GLOBAL WARMING!! THANKS FOR ANOTHER GREAT RIDE! What some unusual places you’ve visited during this leg of trip! 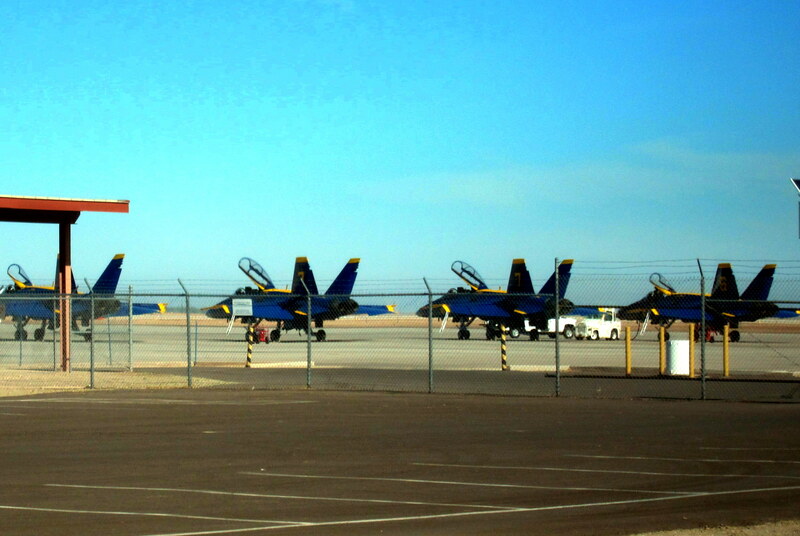 El Centro was great….how fantastic is that to have the Blue Angels right there! 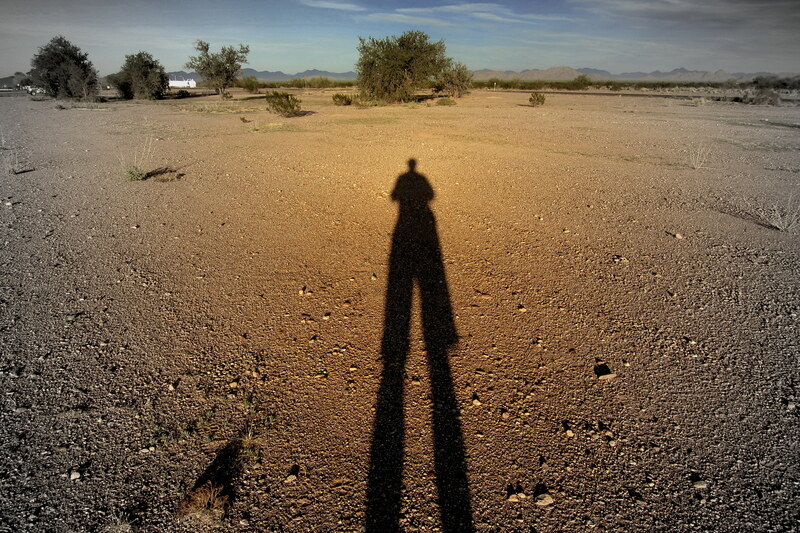 ..Brawley is 112′ below sea level? Wow, isn’t that lower than New Orleans? 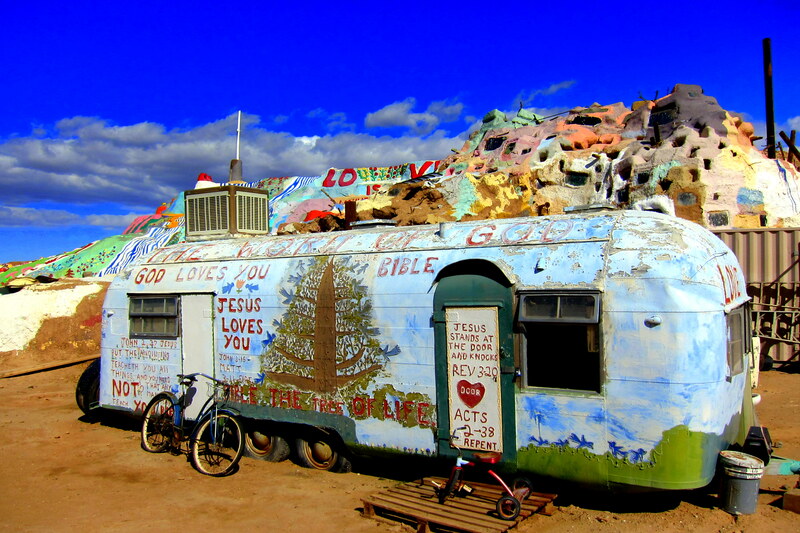 Hey Slab City might be an option if Dow and Jones doesn’t behave. What a hippie-like place that is. I probably have a long lost relative in there somewhere. 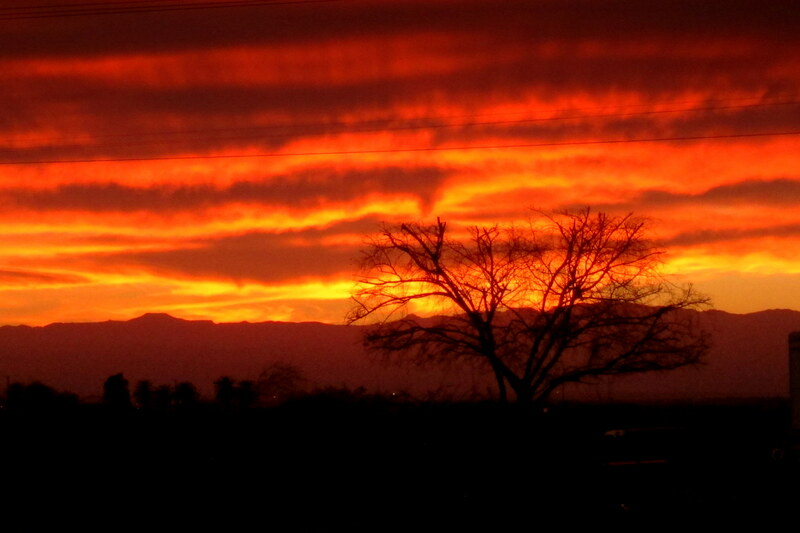 My fav pics are the Bombay Beach Sunset and flooded vegetable fields with mountains in the background. Beautiful! ..Kathy did look kind of beat or wasn’t quite in the mood for salad on the run!! A fantabulous (MY own word, Bill!) journey!! 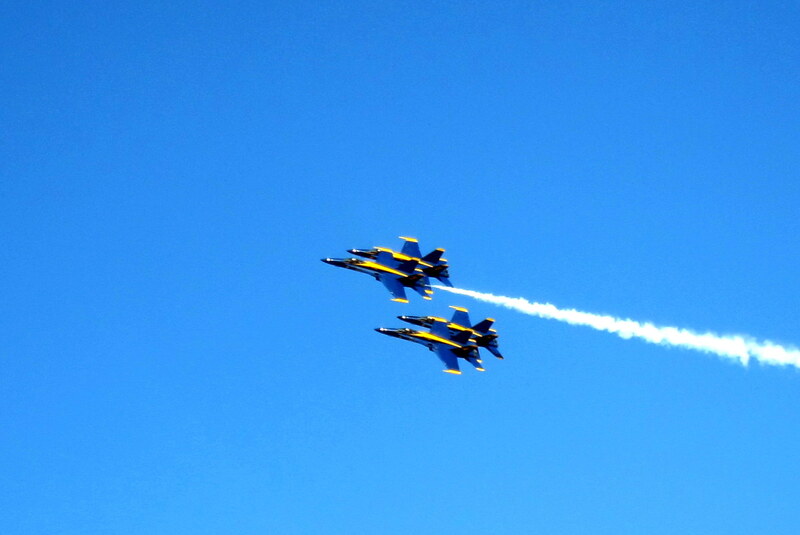 As a native Californian, the Blue Angels are very close to my heart. 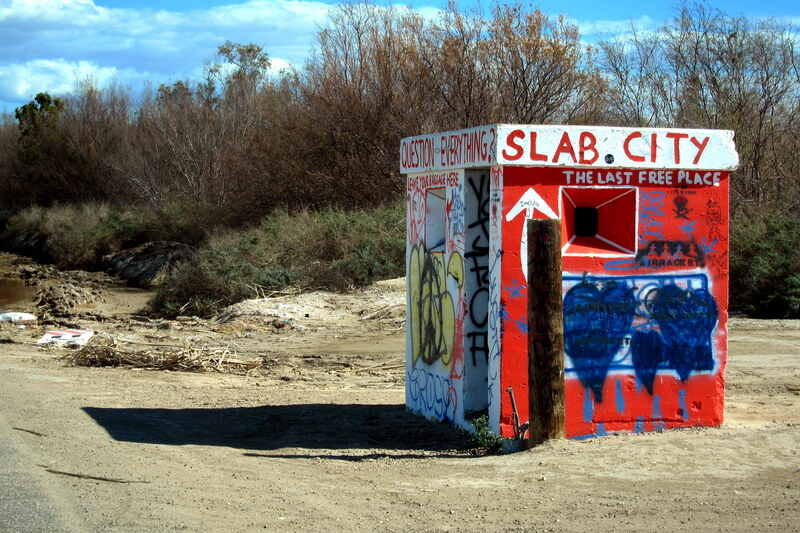 But we especially enjoyed Slab City – wowzer! Those Slab City inhabitants must be some of the more “hard scrabble” hippie folks who lived “around” me when I lived in San Francisco as a 19-20 year old, me the long-legged chick in boots ‘n hot pants in the free-wheeling late ’60s alongside the hippies – it seems in Slab City, they are still protesting the Establishment and still living on next to nothing. The more creative and innovative hippies (who were less brain-damaged from excessive weed and LSD consumption) moved to Humboldt County in far Northern California where they still thrive today, sending their kids to Humboldt State College where MY daughter chose to attend college due to the quality of education Humboldt State offered. Humboldt State is a “mini-UC Berkeley” with the “straight” kids co-existing with the “hippie kids” spawned by the late ’60’s hippies. Interesting dynamic. Chuck’s hard-working daddy (who hauled sugar beets in Chuck’s youth) had his family living in bruisingly hot Brawley “for a few summers”. 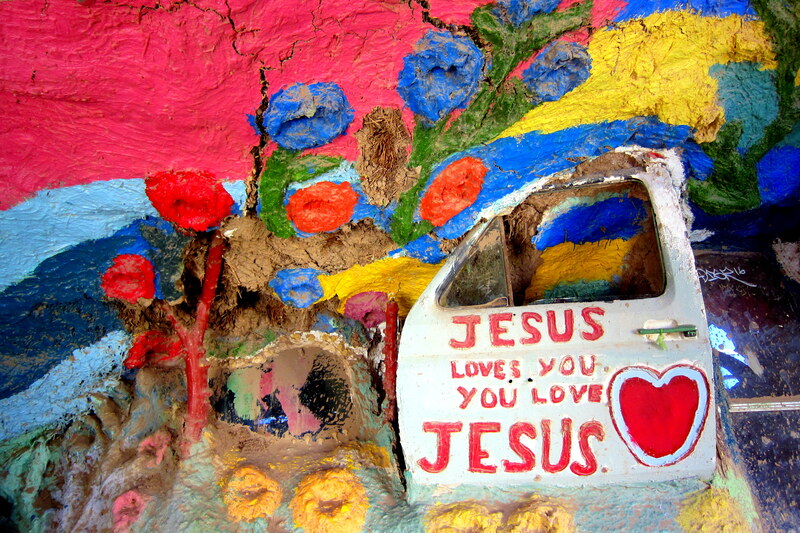 Leonard’s Salvation Mountain was a real treat – “Jesus Loves You!”! One of your BEST sunset photos HAS to this Bombay Beach photo – gorgeous! FRAME IT when you land home in Maine!